Google appears to have paid bloggers to write about Chrome in a way that violates its own paid link policy, according to Search Engine Land. If Google applied a similar penalty to those it’s doled out to past violators, the Chrome download page would be removed from its search engine results for between a month and a year. Don’t bet on that happening, though. The campaign is another example of how Google’s diverse business can lead it to trip over itself. 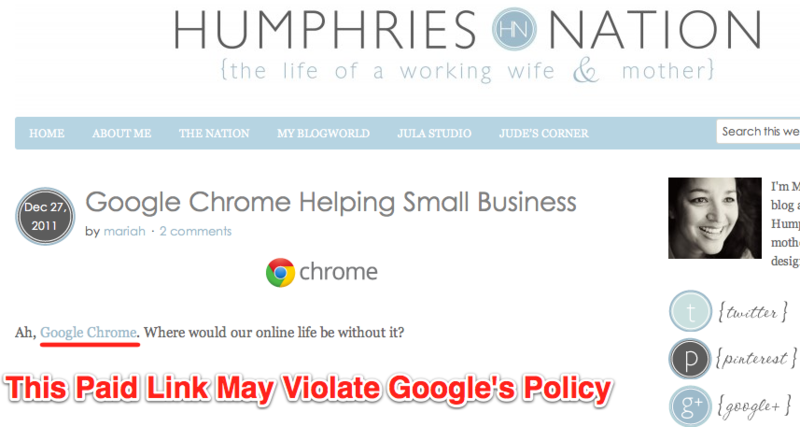 The crux of the issue is that Google or its advertising firm Unruly has sponsored bloggers to discuss its browser and include a “Chrome for small businesses” promo video, as first spotted by SEO Book. Some of these posts purport to be reviews of Chrome and how it aids merchants. In reality, they provide no details on Chrome features or how the browser can actually benefit small businesses. This classifies them as garbage posts — the kind Google demoted in its Panda algorithm update. SEL’s Danny Sullivan does a deep dive into several of the sponsored blog posts if you want examples. It would be fine for Google to have paid for links to the Chrome download page if the bloggers used the nofollow attribute. This indicates to PageRank that a link was paid for and shouldn’t influence search rankings. At least one didn’t. If you really want to voice your discontent over Google sidestepping it’s own rules, you can complain about this sponsored post using Google’s paid link reporting tool. The violation could have been an error on the part of the sponsored bloggers. Still, Google should have predicted scrutiny and been more careful with the instructions the bloggers received. Google’s wide footprint gives it plenty of cross-promotion opportunities. But as we saw with the Fingergate Google+ photo takedown issue, it can also make it hard for the company to consistently adhere to all of its policies.